May 21, 1973 -- The Chicago Tribune prints a report on the full plan to revitalize the central area of the city, a plan for which the Chicago Central Area Committee paid Skidmore, Owings & Merrill nearly $400,000 to draft. Today it is interesting to note what parts of the plan “made it” and what recommendations did not. The stakes were high. As the Tribune observes, “If it bombs, downtown Chicago may bomb, too.” The report puts into words what “white leaders don’t know how to talk about . . . without sounding like bigots.” Whites running from the city to the suburbs, which are becoming increasingly independent of the city. A “growing schizophrenia [skyscrapers and stores bustling by day, with little action at night] . . . changing the Loop. 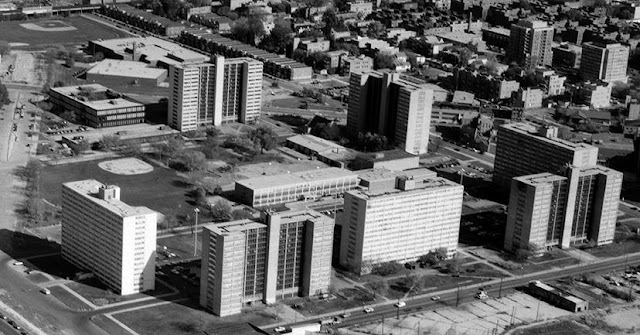 Blacks “still crowded into housing projects like Cabrini-Green” and the potential of a “tipping point where whites start staying away” from the city. The 1973 SOM plan suggested "gradual modification." for projects such as Cabrini Green. • A giant sports arena would be built south of the Loop. It would be within easy distance of the lakefront if not actually on it. • Lake Shore Drive, where it runs along Grant Park, would be narrowed and left turns would be prohibited, forcing motorists heading for the central business district to park in new public lots on the Loop’s fringes and ride on a new subway or another form of public transportation.